“I may have a scrap problem” June goals – Never too hot to stitch! As I said back in my March post about this linky party, my scrap problem is not organisational, it’s disciplinary! That is: I have an organised system for storing my scraps, but sometimes I am not self-disciplined enough to put them away! Like most quilters, I prefer the making part to the tidying part! But, there comes a point where my sewing room looks like a tornado swept through! And that point has been reached. Right now there is a project which is the process of being quilted on the back of the lounge (sofa). There’s a UFO on the floor — it’s there because it was on top of the box of wadding/batting pieces and I needed to access the box from one side of the cutting table and it fell off on the other side of the table where I can’t quite reach it. There’s a flimsy and it’s associated too-small backing waiting for me to enlarge the back. There’s a donated quilt top on another piece of furniture — the blocks don’t line up properly (which is probably why it was donated) and it’s waiting for me to take it apart and put it back together again. There’s a too-wrinkled-to-wear tee-shirt on the ironing board — it fell off the hanger onto the floor of the wardrobe (closet) so needs pressing but I haven’t been in the sewing room since I found it, therefore the iron hasn’t been switched on in days! (Just so you know, I spend weekends with WM and I’m in class on Mondays so I generally don’t spend time in my sewing room between Friday and Tuesday). There’s a second ironing board, used to hold WiP trays and (sometimes) scrap containers, near my cutting table. At the moment it has project trays but there is also a growing pile of scraps which need pressing, cutting and/or storing. On the floor, near my sewing table, there’s a cardboard box containing long strips — those pieces of various widths which are longer than 12″. Up until recently that box hasn’t really bothered me but now it’s overflowing onto the floor. And yesterday, I came home from class with a small bag of scraps donated by one of the owners of my LQS — I haven’t even looked at the scraps themselves yet! I guess you get the picture — even without more photographs! The colour for June for the Rainbow Scrap Challenge 2016 is aquamarine and related colours. I don’t know if I have many scraps in those colours but I know I have lots of green scraps. Green was the colour for last month but I missed it so I may find myself making some green blocks instead. When Mum came to live with us in March last year, I inherited her one UFO! However, her knitting during the thirteen months she lived here gave me plenty of work as I tried to keep up with her output (see these posts here, here and here). But it must have sparked something in me because I’m trying very hard to work only on my UFOs; and I have chosen one project at a time and seen it through to completion — not bounced around from project to project! The green blocks I mentioned for the Rainbow Scrap Challenge would be used to complete one of my most recently started projects: in March, I began the blocks for Oklahoma Shoo Fly, a quilt I designed while playing around on EQ7. I made the units for the ‘Shoo Fly’ blocks from the colour of the month (brown) and had always planned to make the ‘Road to Oklahoma’ blocks in green. The ‘Shoo Fly’ blocks are not finished; the ‘Road to Oklahoma’ blocks are not even started but, you never know, there’s still three weeks of June left and maybe this UFO will get it’s turn this month! Then again, I already have a UFO/WiP plan for this month, so perhaps not! What about you? 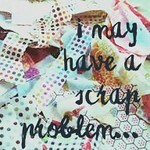 Do you have a scrap problem? Why not take a look at this month’s post over at Confessions of a Fabric Addict? There are some great inspirational ideas there – even if you’re taking a month or two off to enjoy summer! For we folks down-under, winter has just begun with some horrific weather here on the east coast; but it’s a great season for stitch-based projects: the perfect time for curling up under quilts and hand-stitching that binding; or for joining strips of knitted fabric together into blankets! Until next time, may your stitches bring you much joy. I admire your determination! Maybe a bit of it will rub off on me!! I’m bad about not dealing with my scraps after finishing up projects. But at the moment, I’m concentrating on getting the fabric closet whipped into shape. Good luck on your stitching goals for this month.